WITH this week’s news that South African head coach, Gordon Igesund had dropped Bongani Khumalo from the Bafana Bafana squad for the upcoming World Cup Qualifier against Central African Republic, a new captain was chosen in the form of goalkeeper Itumeleng Khune. The 25 year old has 54 caps for his country already. After several years as the number one, the time for him to move to an overseas club appears near. Recent media reports have linked the goalkeeper with a move to Turkish side, Besiktas, and his displays in the AFCON 2013 could not have gone unnoticed. After his World Cup 2010 campaign was cut short after a red card for a foul on Luis Suárez, a major chance was missed to impress possible suitors. Khune’s distribution is the best. The best you will see anywhere. He kicks right to the attacker’s feet. He makes great saves. Against Brazil, he was unbeatable. He is good on crosses too, even if he punches quite a lot. I don’t know why he is not playing in Europe. Maybe not in England because it is so physical, but he could be playing for Valencia and would not look out of place. 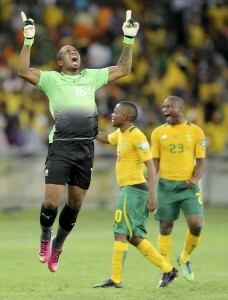 Maybe he is satisfied with what he has here, but maybe after the AFCON 2013 he will move. Khune’s aforementioned distribution is a crucial tactical weapon for both club and country in launching quick counter attacks. During the AFCON 2013, a regular sight was Khune launching pin-point diagonal passes in the direction of Bernard Parker on the the left flank. Even when opposition win the first ball, Khune’s teammates are very quick on to the second ball. He’d save them about 12 points in the past but the way he’s been playing he’s worth probably around 20 points to them this season. As for Africa, we thought Jo-Jo Bell and Thomas Nkono, the two Cameroonians for the 1980s, were the breakthrough, but remarkably few have made it in Europe – Songo’o, Kameni, Kingson… maybe a couple of others. I suspect there’s a self-reinforcing stereotype at work: European clubs look to certain areas for certain types of players (no 10s in Argentina, powerful midfielders in West Africa etc) so clubs and agents who need to sell to survive encourage their most gifted players into those roles. European clubs don’t look for goalkeepers in Africa, so Africa doesn’t divert energy into developing them, so they don’t emerge so there are no role models and the cycle keeps on turning. 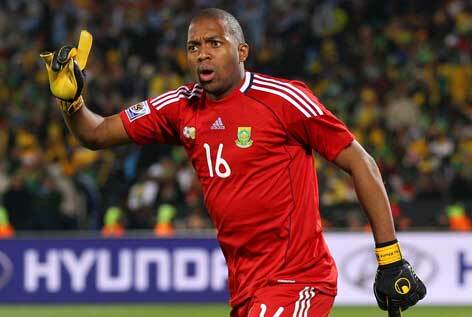 In summary, Khune is an extremely talented goalkeeper who is both an excellent shot-stopper and superb distributor. He has weaknesses in his game, such as his organisation of his back four, and a reluctance to catch crosses, but it’s hoped his new leadership position with his country will see improvements in his assertiveness. Hopefully, some offers are forthcoming from European clubs, and hopefully Kaizer Chiefs demand a fair price and we see him plying his trade in a better league. This can only be good for the development of Khune and therefore of Bafana Bafana. Excellent distributor as mentioned. however excellent shot stopper isn’t enough to distinguish GK as the bare requirement for a GK is to be a excellent shot stopper. His distribution and shot stopping blinds the rest of major flaws in his game. Like u mention poor organising of back 4, poor under crosses and also doesn’t command his box. Seriously doubt European teams in any major leagues will take risk on GK who still requires major development. Could possibly end up at a small European league like Sweden, Belgium or Israel.